Bobby pins weren’t exactly the biggest issue facing Fallout 76 players when the game launched. Between bugs, complaints about a lack of content, and bag-gate, I’d imagine there were more important things to deal with than a bunch of hair clips. But that didn’t stop one member of the community making their feelings known about the item in a particularly creative way. In multiple Fallout games, Bobby Pins have been used to open locks, helping you access hidden areas or treasure caches. In Fallout 3, 4, and New Vegas, the pins don’t weigh anything, allowing you to carry around a collection of hundreds without having to worry about carry capacity – useful for an item that’s prone to breaking if you’re not a particularly good lockpick. In Fallout 76, however, Bobby Pins did have a weight. Coming in at 0.1 lbs – several times heavier than their real-world counterparts – it didn’t take long before your lockpicking arsenal started to become to heavy to carry around. In fact, it would only take 100 or so pins before they started out-weighing weapons and armour. Howard described the package as the most creative letter he’d ever received from a fan. Whether the message was a direct catalyst for change isn’t clear, but it’s worth noting that Bobby Pins now weigh 0.001 lbs in the game – just 1% of their original weight. 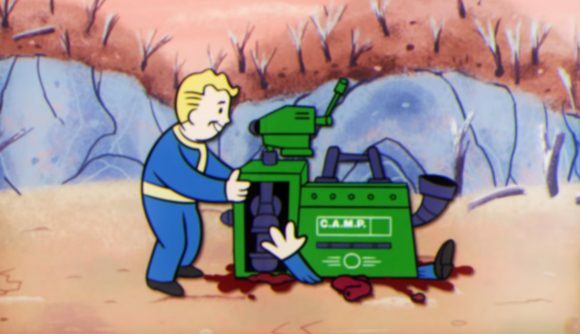 Bethesda, has, of course, made a few other changes to build on Fallout 76’s troublesome launch. West Virginia now features a survival mode, and there are plans for raids, prestige, and a nuclear winter. We’ll just have to wait and see whether those changes are more impactful than the tweak to Bobby Pins.